Amazon: Select Armitron Watches for Women and Men Only $29.99-$39.99 (Reg. $69.99-154.99) – Today Only! I like this pretty Armitron Women’s Swarovski Crystal-Accented Silver-Tone Watch for only $29.99 (Regularly $69.99) with FREE Super Saver Shipping! This watch features a mother-of-pearl dial with textured hearts at the center and 50 Swarovski crystals on the bracelet and lugs. 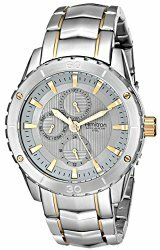 For the men I like this Armitron Men’s Stainless Steel Two-Tone Watch for only $39.99 (Regularly $114.99) with FREE Shipping! This watch is water-resistant up to 50 meters and features gold-tone hands and indexes, a protective mineral crystal dial, and has day, date and 24-hour subdials. Head on over to find your favorites. Happy Shopping!